Today, a special guest appeared in numerous theater classes at Cornish College of the Arts. Broadway performer Don Darryl Rivera, a’06 graduate of Cornish, is back in Seattle for the 5th Avenue Theatre’s season opener, Man of La Mancha. Following opening night, he visited campus for the day to talk about forging a career as an actor and about appearing on Broadway in Disney's Aladdin. Photo: T. Martin for 5th Avenue Theatre. When Don Darryl Rivera arrived at Cornish College of the Arts today, he visited numerous Theater classes to talk about making a career out of his art. “Cornish prepared me,” he said in an interview earlier this month. 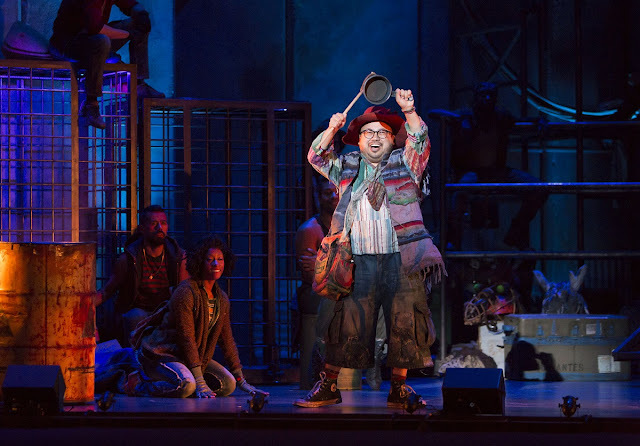 Currently entering his fourth year in Disney’s Aladdin on Broadway, Rivera received a call from the 5th Avenue Theatre earlier this year asking if he’d be interested in playing Sancho in Man of La Mancha. The show opened last night and Rivera was on campus the next day to talk to students. As a child, Rivera first started performing as part of Filipino dance group, Kultura, and later joined kaSAma, a hip-hop dance group that regularly appeared at the Oddfellows Hall. “My gracefulness comes from Filipino folk dance,” he said. “My hip hop dance training really helped my comedic moves, making me so aware of my body that I could be a walking punchline.” At Bishop Blanchet High School, his favorite part of school was acting and theater classes. When it came to college, “I only applied to one school, Cornish. I wanted to stay in Seattle and thought I could sustain a viable career as an actor this way,” said Rivera. Following Cornish, he got an internship at Seattle Shakespeare and then started appearing across the city at various theaters, winning Seattle’s highest theater award, the Gregory, in 2009. Through connections formed in the local theater scene, he was cast at top regional theaters such as The Shakespeare Theatre Company in Washington, DC. He also wrote two musical plays while working at the Seattle Children’s Theatre. The first, Harold and the Purple Crayon along with Auston James (Music) and Rob Burgess (Lyrics), received two 2011 Seattle Times Footlight Awards for Best Actor in a Musical and Top for Tots. The work continues to be performed by children’s theaters across the country. For the second in 2013, Adventures with Spot, Rivera collaborated as a co-composer with Rob Burgess and co-book writer with Linda Hartzell. At the 5th Avenue, he was cast as Iago in the world premiere of Disney’s Aladdin in 2011, a role he was invited to reprise on Broadway. grateful,” he said. He still remembers with awe how that led to walking into a workshop in New York and hearing from famed Disney composer Alan Menken that he’d written a completely new song for villain Jafar and Rivera’s character Iago to perform on Broadway. Rivera continues in Man of La Mancha through October 30 at the 5th Avenue Theatre. His next performance in Disney’s Aladdin will be November 1 at the New Amsterdam Theater. The 5th’s December show, Disney’s Little Mermaid, will star another Cornish graduate, Helen Hayes Award-winner Diane Huey '08, in the title role.